When I first got the Diamond in June 2008, it was the top of it’s line, the latest touch screen model, and I thought it was pretty cool. 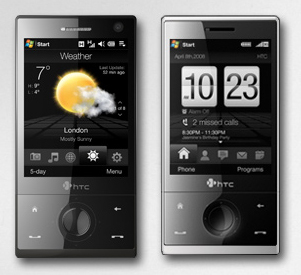 The design was sleek and pretty, and the interface was quite cute. Obviously very soon its newness wore off and I started to realize how painfully slow it was (especially compared to the iphone- and I’m talking about the first gen one too!) and how most of the “cool” functions don’t even work that well. Occasionally it turns itself off, this random connection screen pops up every 5 minutes for no reason and the clock doesn’t work (it lags no matter how many times you reset it). Oh and the quality of the voice conversations was also awful. I’ve been told that I sound robotic. Regardless, I convinced myself that it’s not too bad and I worked with it, determined to hold out until the next iPhone comes out this year (fingers crossed!). Unfortunately, unlike my trusty old Nokia cell, which held out for months after the battery expanded and I couldn’t close the back, when a touchscreen starts to die, it dies a swift death. My touchscreen stopped working and there isn’t much I can “work with” after that. The worst thing was, I called customer service and found out that I can’t even recover my contact list! I was under the impression that smartphones are mini computers, and figured that if hardrives can be recovered when a pc dies, it shouldn’t be too hard for them to recover my contacts. But no, apparently they reset your phone when they examine it and there isn’t some magic the technicians can do to recover it. I am so mad at them and at myself for not backing up my phone (the backup program is not userfriendly). I just spent the whole evening painstakingly going through my contact list manually and typing it into my google contacts (luckily I figured out how to use the few keys on my phone to get me the relevant page). I figured that I can transfer them over when I get my new iPhone (when it comes out). I’m placing my bet on the advance of technology in the last two years and the superiority of Apple over HTC, that this won’t happen again. I’m absolutely never buying another phone from HTC again (don’t know what made me do it in the first place- must’ve been the pretty glass case!). I’m back to my old Nokia in the meantime. Apple better come out with a new iphone soon……..